Having won nine constructor titles and seven driver world championships it is fair to say that the Williams F1 Team understands its craft. The fact that speed is also important off the track can be seen at the racing team’s development department. There, the engineers have successfully applied additive manufacturing, using EOS technology, to the construction of the exterior parts of the front wing assembly for their 2016 racing car. Work begins on designing a new car long before the end of an F1 season. While working to continually improve the performance of the current car out on the track, the teams of engineers are simultaneously designing and testing its successor. This fact increases the necessity of using and deploying available resources in the optimum way – whether in terms of personnel or materials. In the construction of Formula racing cars, teams must stay true to a complex set of rules while finding the best-possible solution to the golden ratio of ‘high speed, high reliability, low weight’. Each season, the team sets itself this challenge anew. The development crew of Williams F1 are based in Grove, Oxfordshire, in the United Kingdom. For many years now they, like their competitors, have used carbon fibre composites. These materials have proved their value in Formula 1 because they deliver extremely high stability at very low weight. Having said that, they represent a problem, and not only for the Williams developers, in that they are very expensive. Their use requires the costly and complex construction of moulds and tooling. The work is time-consuming and represents a key issue when it comes to the need to produce individual components for the manufacturing of prototypes to strict deadlines. Historically, the racing team has taken a rather conservative approach when it came to the work of its engineers. At the same time, the team from Grove had always backed its belief in innovative technologies. Following this principle, the technical department set about integrating additive manufacturing into the development processes of its prototypes for the multi-part front spoiler. The component is an aerodynamic centrepiece of the car, ensuring that the tyres retain optimal grip through the fast curves of the track. Computer simulations support the calculations for the front wing design. Nonetheless, at a certain point, wind tunnel tests need to take place under live conditions – because despite all the intelligent IT algorithms the performance of calculation models is limited. This is where the concept of ‘trial and improvement’ begins whereby the Williams team examine a number of design variations. As carbon fibre materials are, as mentioned, difficult to work with, Williams has decided to additively manufacture prototypes for the wing in order to test the shape. 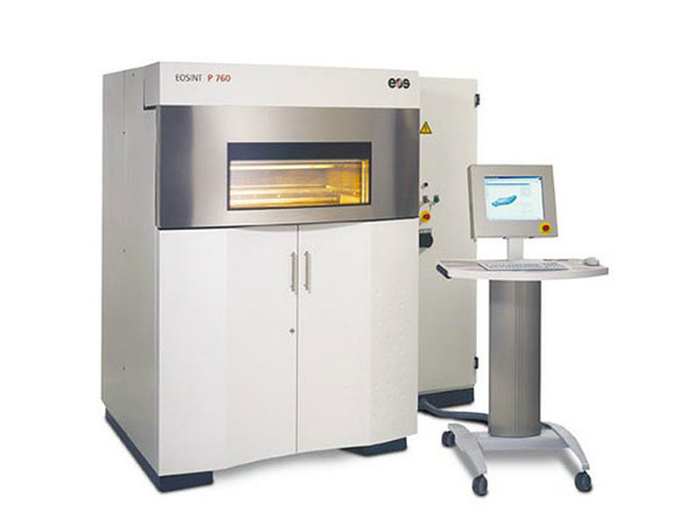 At this point two machines come into play; the EOSINT P390 and, in particular, the EOSINT P760 with its large build volume, both of which are suitable for the production of plastics using laser sintering technology. The Williams engineers initially design a number of front wing cascades using CAD software. Each of these designs contains the intricate geometries that correspond to the ideas and simulations for high down-thrust and optimum tyre grip. The team transfers these early designs to the EOS system, which then produces the mould prototypes to the highest precision. As soon as the part leaves the build chamber it is further evaluated by the relevant experts. Once the construction team has drawn up a shortlist of potential designs, the complex building of the appropriate moulds takes place for the actual carbon fibre composite components – which will ultimately be tested on the racetrack. 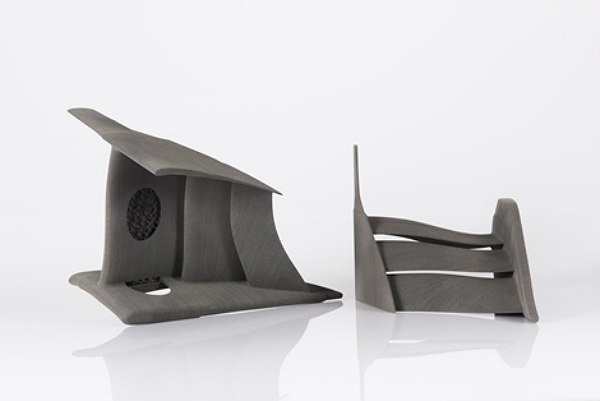 The complex design of the individual parts presents no particular problems using the additive manufacturing process. The extreme flexibility of design is perhaps the greatest of the many advantages offered by this technology. The EOS machines also achieve the necessary component-mechanics and dimensional tolerance with ease – to the extent that it was almost clear from the outset that the fundamental prerequisites that defined a successful outcome would be achieved. But was this the case with the central requirements of simplification, faster production, lower costs? The speed of the manufacturing also means that within a given time period it’s possible to achieve many more design iterations: Where a deadline might previously have allowed only enough time for one production run, the technology means that now multiple repetitions are possible. The total saving of development time that results from this translates into cost reductions.